Submitted by self4depends on Mon, 2018-07-16 07:49.
batch exporter is nice tool.Its very easy to use and excellent function!! 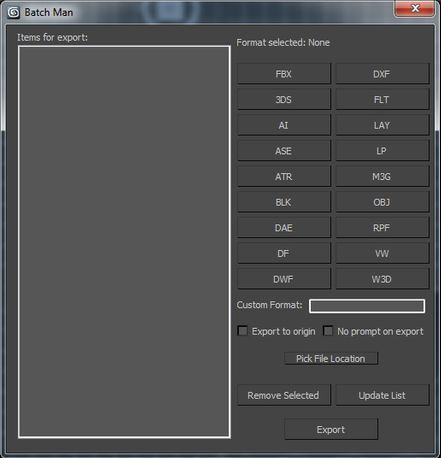 I will recommend to use batch exporter. Submitted by wmeddy on Fri, 2015-08-21 00:29. Submitted by hsccsmith on Wed, 2015-02-04 13:52.
ok i will do that.And thanks for your excellent [email protected] Hair cuttery jupiter, Florida. Submitted by asymptote on Tue, 2014-03-18 05:32. Fantastic little script, and exactly what I was just looking for, my only gripe is, would it be able to remember the export format (or set one as default) and have the "No prompt on export" button also checked by default ? Also not to have the "do you want to save your scene" request, or have it as an option. Submitted by Benjam901 on Mon, 2014-01-20 06:17. Submitted by HenryCalloway on Wed, 2014-01-08 08:02.